"I had no illusions about love... It came, it went, it left casualties or it didn't. People weren't meant to be together forever, regardless of what the songs say." Remy doesn't believe in love. And why should she? Her romance novelist mother is working on her fifth marriage, and her father, a '70s hippie singer, left her with only a one-hit wonder song to remember him by. 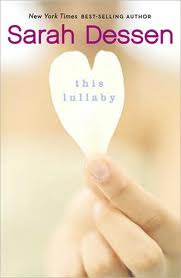 Every time Remy hears "This Lullaby," it feels like "a bruise that never quite healed right." "Wherever you may go / I will let you down / But this lullaby plays on..." Never without a boyfriend, Remy is a compulsive dater, but before a guy can go all "Ken" on her (as in "ultra boyfriend behavior") she cuts him off, without ever getting close or getting hurt. That's why she's stunned when klutzy, quirky, alterna-band boy Dexter inserts himself into her life and refuses to leave. Remy's been accepted to Stanford, and she plans on having her usual summer fling before tying up the loose ends of her pre-college life and heading for the coast. Except Dexter's not following Remy's tried-and-true rules of break-up protocol. And for the first time, Remy's questioning whether or not she wants him to. This is my first Sarah Desssen. Cute. I enjoyed it.I'm all about the geeky, quirky boys! I did think there was too much teen drinking, but I guess that's just me. I didn't do those things in high school. But, I know I'm a rarity. I enjoyed Dexter the most. I loved his character. I could picture him and I felt like I knew him and knew what he was going to do next. He felt like a friend. Remy was a puzzle to me. I kept wondering what she was going to do next. Why was she feeling a certain way or acting a certain way. I loved all the music lyrics. Made me wish I could hear the music that went with them! I did enjoy it. I'll be picking up another Dessen book! What should I read?